The amazing Defender outline has been created by snow artist Simon Beck who walked out 20,894 steps in sub-zero temperatures. Land Rover announces World Land Rover Day: 30 April 2018 marks 70 years since its debut at the 1948 Amsterdam Motor Show. The drawing was a tribute to the Wilks brothers’ first sketch of the original Land Rover shape in the sand of Red Wharf Bay, Anglesey, UK. La Plagne, France, 10 April 2018 – After 70 years of all-terrain adventures and global expeditions, Land Rover has once again taken the Defender to new heights. Stretching over 250 metres (820 feet), the spectacular Defender outline was imprinted on the side of a mountain in the French Alps. The one-off snow art was created to announce World Land Rover Day on 30 April, exactly 70 years since the original Land Rover was first shown to the world at the 1948 Amsterdam Motor Show. The unique image is a tribute to the moment when the engineering director of Rover, Maurice Wilks, first sketched the shape for the original Land Rover in the sand of Red Wharf Bay and proposed the idea to his brother Spencer, Rover’s managing director. The forward-thinking design was eventually christened the ‘Land Rover’; the outline of which we now recognise as the Defender. Those first sand sketches went on to create one of the most iconic vehicles in the world and ultimately led to the creation a company that has become the most famous 4×4 manufacturer on the planet. 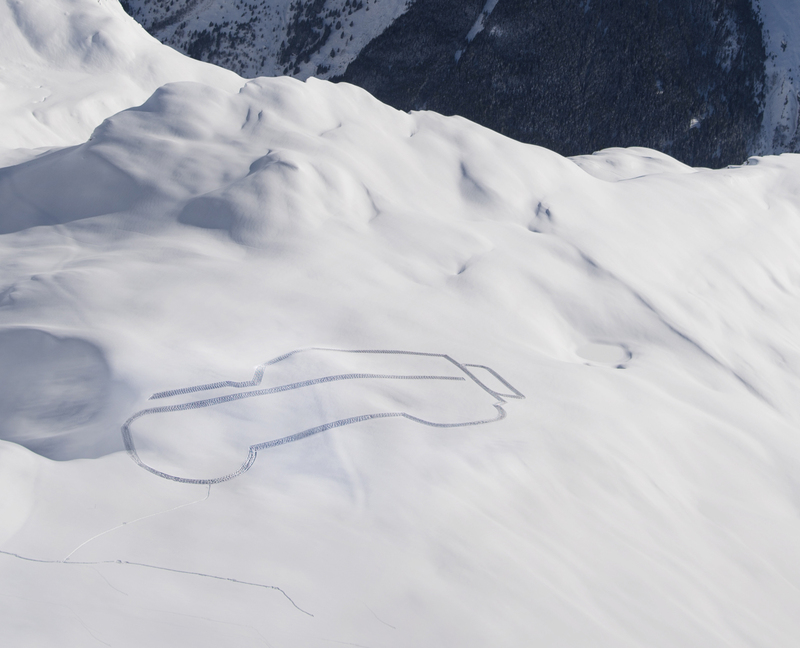 Snow artist Simon Beck, who specialises in creating geometric outlines on foot, braved sub-zero temperatures to start the celebrations by creating the Defender outline 2,700 m (8,858 ft) up at La Plagne in the French Alps. In 2015, Land Rover re-created the outline in the sands of Red Wharf Bay, to mark the final year of current Defender production.